My wife and I are fans of Trader Joe’s. If you’re fortunate enough to have a location in your area, there are some items you might want to purchase there instead of at your local grocer, warehouse store or your preferred shopping destination. We have low prices, every day. No coupons, no membership cards, no discounts. You won’t find any glitzy promotions or couponing wars at our stores. If it makes you feel any better, think of it as all our items are on sale, day in and day out. That said, many of their items are pretty affordable and worth you checking out, if you want to save more money on some everyday goods. I’m going to list some of the items that we typically purchase AND think are quality (good tasting). I also include several ideas that I got from a recent Reddit post question that I submitted, so please check that out for even more ideas. In particular, we purchase the Himalayan Sea Salt and assorted pepper seasoning (that come with their own grinders) for about $2. These last us a good while and really make dishes taste a lot better. I don’t think I’ll ever go back to the pre-ground pepper. Oh man. 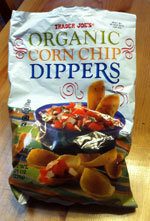 They have these corn chips that are similar to Frito’s corn chips – but much better and organic. A bag of these is another $2 – but be forewarned. They are quite addicting. We buy these colon cleanse pills there (yes, it’s good to clean that out once in awhile) that are $10 per bottle. Now, you may be saying, “That’s expensive!” – and relatively speaking, you are right. But, when you compare these to other stores, you’re looking at $12-20 for these. TJ’s generally prices there produce per item – not by weight. So, you could walk into the store and get a banana at lunch for 19 cents. Not bad! And, a bag of avocados at Costco runs about $4 (for 4) – and this is a good price, being they are organic. Not all the produce is a great bet though – so be aware. This is probably one of the biggest reasons that people frequent TJs – for their $2-buck chuck as folks affectionately call it. If you are a coffee drinker, you might want to try out their “Joe’s Blend” or other varieties that folks enjoy. $5 for a can – not too shabby. I’ve had a few of these and some are quite tasty – others, not so much. According to the Reddit post, many enjoy the Indian dinners TJ’s has (and are somewhat healthier for you too than traditional frozen entrees). Here’s another item that you can find for cheap at TJ’s – but again – sometimes they aren’t as fresh or long-lasting. Over Christmas, I bought a bouquet for my wife that lasted quite a while – but other times, I’ve actually taken some back because they didn’t last. For organic milk – they have a pretty good selection at good prices. Also, folks love their cheeses – decent quality at low prices. 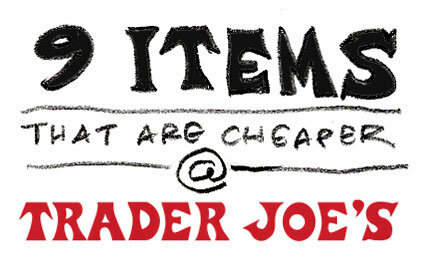 What are some items that you prefer to buy at Trader Joe’s because it’s cheaper than any other place? These posts are incredibly helpful! If I don’t say it often enough .. you guys are amazing. Love reading your emails. Btw! Trader Joe’s mango yogurt is out-of-this-world .. addicting !! Thanks for reading Annie! Their food is addicting.. and fairly inexpensive to boot. In general I’m not a big fan, because I don’t really buy frozen or pre-prepared food. BUT — when I’m in a place that has one I will stop in for nuts/dried fruit (good selection and pretty cheap) and for their hand lotion, which is just awesome. I have never been to a Trader Joe’s before. I love Trader Joe’s too. I’m all about the hummus, chips and wine. When I tell people I shop there they think it’s “expensive” until I encourage them to check it out. Love their hummus.. roasted red pepper! I love to buy their extra lean ground beef. It’s the only place where I can find 96% lean 4% fat beef. For such a small store they have everything you need to make great meals. I love the fact that I don’t have to check any of the labels for “nasty’s” whatsoever. I also like to buy from their dried fruit section. Maybe I’m buying the wrong stuff – but haven’t had much success with their meat. Might have to try the ground meat. We LOVE Trader Joe’s! Our fave purchases there? Pasta (99 cents for a 16oz bag), snacks like nuts and raisins, and like you, we love their chips! They also sell organic frozen veggies for cheap. Good deal on the pasta.. I buy the Irish Breakfast tea ($2.99 for 80 bags) and couscous ($1.99) on a regular basis. Their (Indian) Marsala burgers are also very good – $2.49 for a box of four. Addicting is what they are..
We’ve found that some of their grains run cheaper – specifically, larger bags of quinoa and wheat bulgur. – Coffee & Wine – YES! – Frozen mushroom blend: in the freezer section, there is a gourmet mushroom blend that goes so well in a lot of our dishes, and we like mushrooms. – Coconut milk: $0.99 per can is a steal, I think it’s $1.50 for the thicker cream. Thanks for the extra items to be on the lookout for Laura!